Life gets busy. Somewhere between family, friends, work, and sleep we’re supposed to be fit, healthy, thriving adults. The alarm sounds, we’re taking our morning coffee on our morning commute, wishing we had set the alarm a little earlier and taken care of that daily workout that hasn’t been so daily. We stare at a screen, systematically sort through an inbox that moves faster than a twitter feed and navigate our day. We make it home and arrive at the moment of consequence… are we getting out the door? We aren’t really sure if we ran out of time or ran out of energy but the workout we had planned never gets off the ground. We make promises to ourselves that tomorrow will be different—tomorrow will be better. Trouble is, tomorrow is now today and things didn’t change. Maybe that’s your story, maybe it isn’t, but we all feel the tension of how things are and how they could be, the space between where we are and where we should be. Could we be fitter, faster, stronger, more productive, more engaged? Could this be the year the excuses are put to rest, we finally put it all together and realize our potential? Could we hope more, believe more, do more? I’ve been around too long to tell you that fitness is the most important thing in life- even at the professional level. There are things more important than times, teams, contracts and the daily sweat – things like family and relationships. But I will say this- living a healthy lifestyle will enhance every area of your life, athletic and otherwise. And if you don’t take time to care for yourself you won’t be around to take care of anything, or anyone, else. "Life doesn’t have to be something that just happens to you… but it will, if you don’t have a plan." The common denominator with my most successful friends – from businessmen, to big league ballplayers, to brokers, to writers, to television personalities – is they show up. It sounds simple, but they’ve made a commitment to a particular way of life, one that doesn’t involve settling or taking the easy way. Working out isn’t easy but it is rewarding. We don’t control how much talent we possess but we do control our alarm clocks, how hard we work and how we spend our 24 hours. Get out the door; show up. The first step is the best step; it’s where intent meets action. I lost my dad to cancer a handful of summers ago. The nine months from diagnosis to death transformed me; it put an old head on young shoulders. It gave me a new lens on life, relationships, goals, and things I wanted to do. My dad was 59 and towards the end he told me something over and over again. It’s something I’ll never shake, I can hear him saying it now, “I thought I’d have more time.” He knew he was on death’s door and he had a world of regret and a long list of things he wanted to do. If you are like me, you probably find yourself with a similar list and think you have plenty of time. We all could use a dose of urgency. Tomorrow is promised to no one. That thing you want to do, that person you want to be, start today. What does that mean? Start by writing down your top goals for the next six to nine months. Next, circle the three that are most important to you. Cross out the others – you’re only kidding yourself. If you try and do everything, you end up doing nothing (if you can accomplish more than three then well done, repeat the steps above and aim higher). Examine the three and write down five to six objectives that you can accomplish over the next month to move you closer to your goal. We’re over a month into 2015 and many of our resolutions are already up in smoke. Why? For most of us the goals are too vague. “Losing weight” isn’t a goal, it’s a pipedream. “Eating 5 vegetables, drinking three liters of water, and walking for 30 minutes a day” is a specific, attainable goal. Signing up for a race, getting a training plan, and finding a training partner or training group are some of the best ways I know to kick-start a healthy lifestyle change. Want to write a novel? Read an hour a day then write an hour a day. There are no shortcuts to anything worthwhile. In The Lord of the Rings, J.R.R. Tolkien said, “All we have to decide is what to do with the time that is given to us.” Tolkien would know. He spent 14 years writing a novel that today serves as the benchmark for all fictional literature. Plan the work and work the plan. Another great idea is to create a personal mission statement, I write a new one each year. It will change over time and if you keep them you’ll see how you’ve evolved. Have the courage to write your goals down and put them somewhere you’ll see it every day, because dreams don’t come true, goals do. Josh Cox is the American record holder in the 50K, a four-time U.S. Olympic Trials qualifier and three-time National Team member. 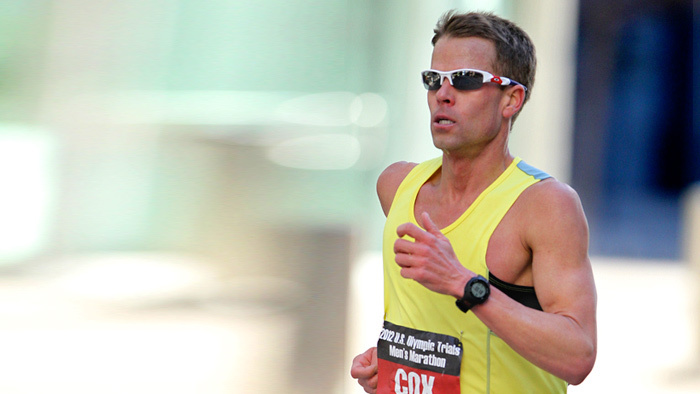 In addition to running 140 plus mile weeks, Cox is part of the NBC and NBC Universal broadcast team and has contributed to the Chicken Soup for the Soul series of books.